In website optimisation a hypothesis is a change and effect statement that is based upon qualitative (e.g. customer complaints) and/or quantitative data (e.g. web analytics). This should be measurable and ideally provide a rationale for why a change to the customer experience will influence the success metrics. Creating an hypothesis is a critical step in the test and learn process outlined below. 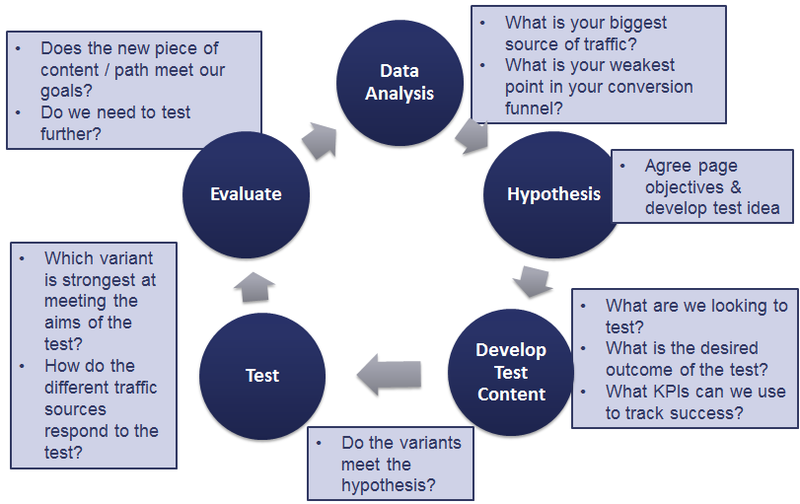 Without a strong hypothesis for each A/B test the optimisation process is likely to become random and not reach its full potential to improve the bottom line. Without a hypothesis there is also little, if any, learning from tests as there needs to be a logical reason to believe a new experience is better than the default. Failure is how we learn, but it is also important to try and understand why something didn’t work. Optimisation process – 8 steps guaranteed to boost your conversion rate. Prioritise tests – How should you prioritise your A/B test ideas?